For years, a shortage of labor and rapidly changing industry needs have left a cornerstone of the flooring industry, installation, in crisis. INSTALL, which represents installers, contractors, manufacturers, associations and consultants, aims at elevating industry excellence through training and certification, and has the resources, capability and commitment to strengthen floor covering industry standards. “As conditions and materials change, INSTALL hosts educational events with manufacturing partners who assist in the development of new certifications and techniques.” Through these partnerships, McGrath said, INSTALL is fighting for better standards to ensure proper installation to increase longevity and decrease product failure. McGrath added, however, that there are challenges when it comes to installation — 2016 was about resolving common problems associated with moisture mitigation. As a result, INSTALL developed a Substrate Preparation Certification which aims to decrease flooring failure through proper preparation and installation. “Additionally, we’ve seen installers and the A&D community paying more attention to the importance of in-situ moisture testing,” added McGrath. INSTALL also faces challenges by giving back. The Certified Installation Manager (CIM) Scholarship and Helmets to Hardhats (H2H) partnership, among other intiatives, support INSTALL’s mission of getting qualified installers in the field. 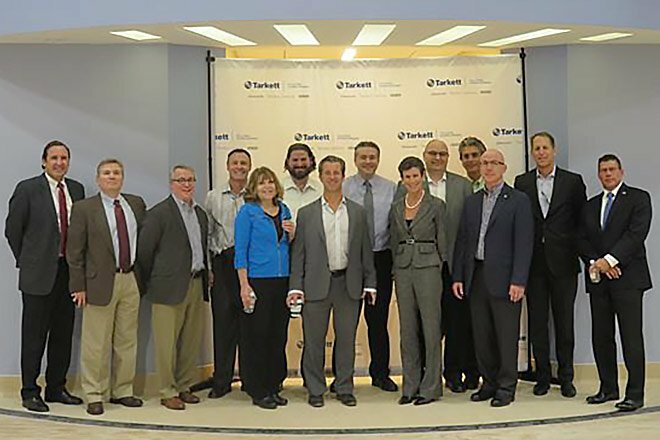 INSTALL partner Tarkett has committed to prevention of floor covering installation failure by integrating INSTALL certification requirements into its resilient specification. The new language took effect in December 2016: “Contractors for floor covering installation should be experienced in managing commercial flooring projects and provide professional installers ‘qualified’ to install the flooring materials specified. An installer is ‘qualified’ if trained by Tarkett or a certified INSTALL resilient floor covering installer.” Previously, INSTALL and Tarkett collaborated to deliver the Construction ICRA: Best Practices in Healthcare Construction, a comprehensive training and certification program designed to reduce hospital-acquired infections, provide training to professionals and ensure proper protocols are followed.